I was recently asked to help teach my daughter's Pre-K through Kindergarten children's class at church. At first, I wasn't sure she would be thrilled with the idea, but she was ecstatic that mommy would be in class with her which made me very happy. There are only a couple kids in class right now, but it is still fun to plan the lessons. Maybe I'm a bit childish at heart, but crafts for kids that age are so much fun. It is freeing to enjoy the process of making something and not worry about perfectionist results. This past Sunday, we studied a Pre-K favorite and went over the story of the "wee little man" Zacchaeus. I came across a cute and useful felt craft about it on Pinterest. It is a tax collector's coin pouch from the When You Rise blog. 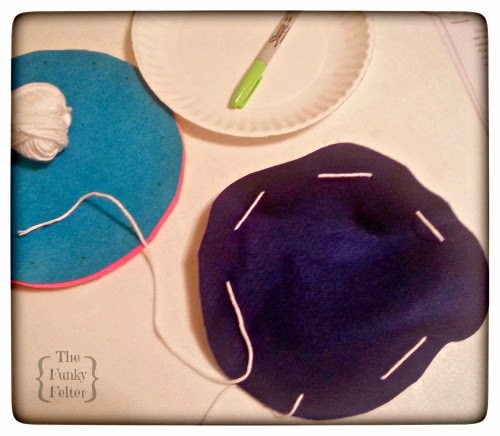 Basically you cut a circle from felt and thread yarn or twine through small slits around the perimeter of the circle. Then pull it tight to form a pouch. I love that the emphasis with this craft is not about climbing the tree or even Zacchaeus' small size, but rather, it is about him being a really bad dude who took people's money. That's really the point anyway - Jesus forgiving a publicly hated sinner who makes the choice to repent and change his ways. Not necessarily that he's a shorty who's also a fantastic tree climber, although crafts about those things are fine too and have a purpose. I appreciate this craft with a unique perspective. And, my daughter loved the hands-on activity! It was truly an enjoyable craft to learn from, not just something to take up time. I also used the cute little video below, Jesus & Zack by Tim Andrews on YouTube. My daughter understood the modern animation, and it was short enough to keep her attention. She wanted to watch it again and again. I love the part where Zack's little face changes to a toothy smile after Jesus calls him down from the tree!